Ms. Deeba is a passionate microbiologist and a researcher having research experience in clinical bacteriology and antimicrobial resistance. She also served as a lecturer at Independent University, Bangladesh (IUB). She has obtained her B.Sc and MS degree from the Department of Microbiology at the University of Dhaka. 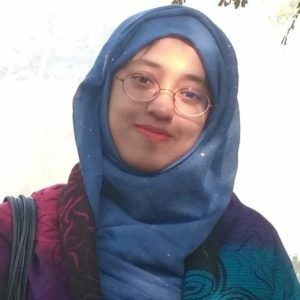 Working as a research officer and senior research assistant, she carried out several research projects at International Center for Diarrhoeal Diseases Research, Bangladesh (icddr,b) and studied respiratory bacteria and drug-resistant enteric bacterial pathogen. Throughout her research tenure, she received several hands-on training on Bioinformatics, Biosafety, and Biosecurity etc. Ms. Deeba received National Science & Technology Fellowship provided by the Ministry of Science and Technology, Govt. of the People’s Republic of Bangladesh for her MS research and was awarded prestigious Dean’s Award of the Faculty of Biological Sciences of the University of Dhaka for outstanding academic performance during her graduation.